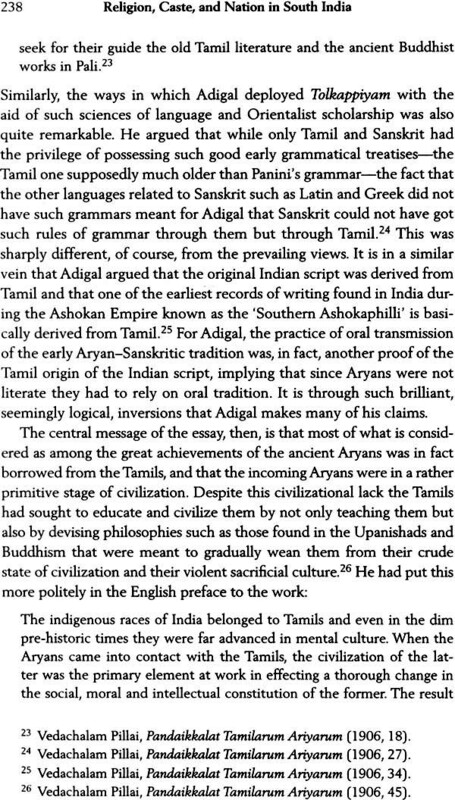 The extraordinary power and solidity of regional ethno-nationalist identities such as the Tamil in South Asia continue to defy easy explanations. In this work, Ravi Vaithees, departing sharply from conventional ‘secular’ accounts, examines and deeper religious roots of Tamil/Dravidian identity formation and its relationship to broader processes of nationality formation in South Asia. 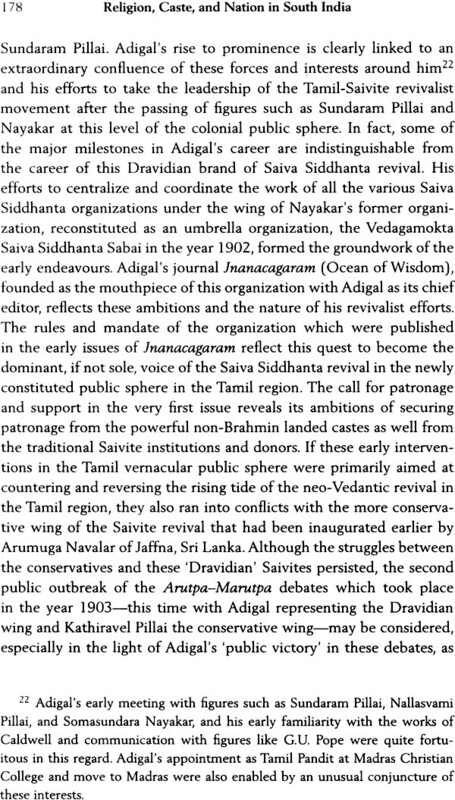 Through a close and innovation reading of the life and career of Maraimalai Adigal (1876-1950), who played a central role in consolidating the intellectual and cultural foundation for non-Brahmin Tamil nationalism and the Dravidian movement, the author presents interesting insights into the history of the neo-Saivite revival. 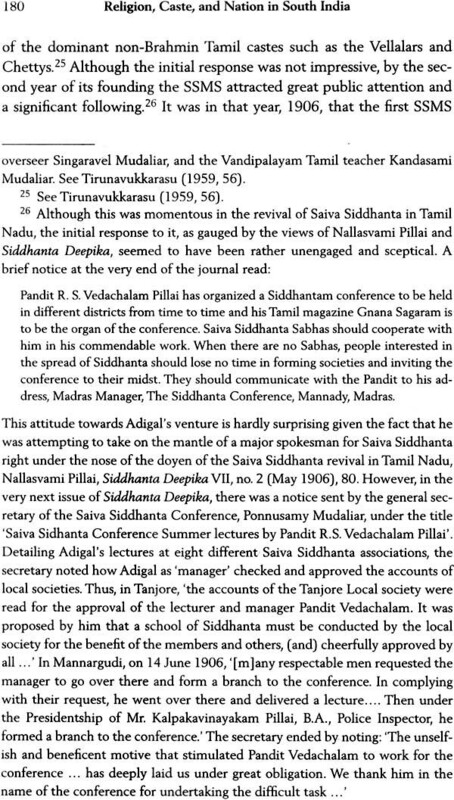 The neo-Saivite articulation of non-Brahmin Tamil nationalism endowed it with a critical spirit that not only eschewed the philosophical idealism found in Brahminism and neo-Vedantic thought but also celebrated the more firmly grounded, earthy, and sensuous Tamil tradition reflected in ancient Tamil and Bhakti poetry and Tamil Saiva Siddhanta. This has been brought forth by drawing from a range of influences including colonial and Christian missionary critiques of Brahminism and neo-Vedantic currents. 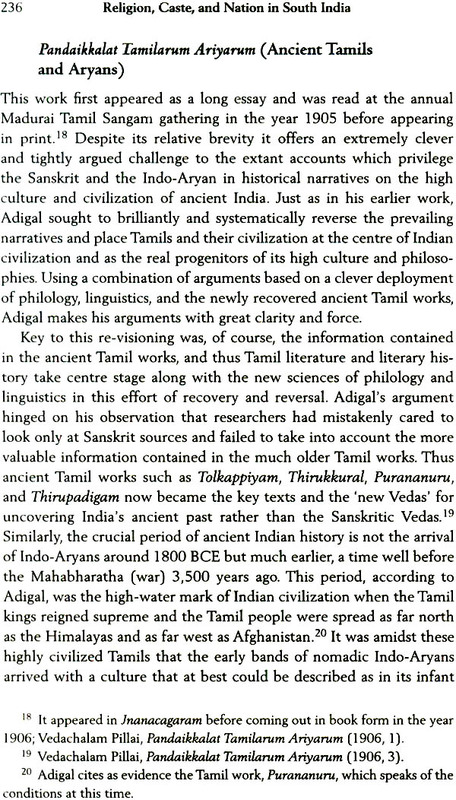 V. Ravi Vaithees is Associate Professor of Modern South Asian and World History at the University of Manitoba, Canada, where he has been teaching for the past 14 years. 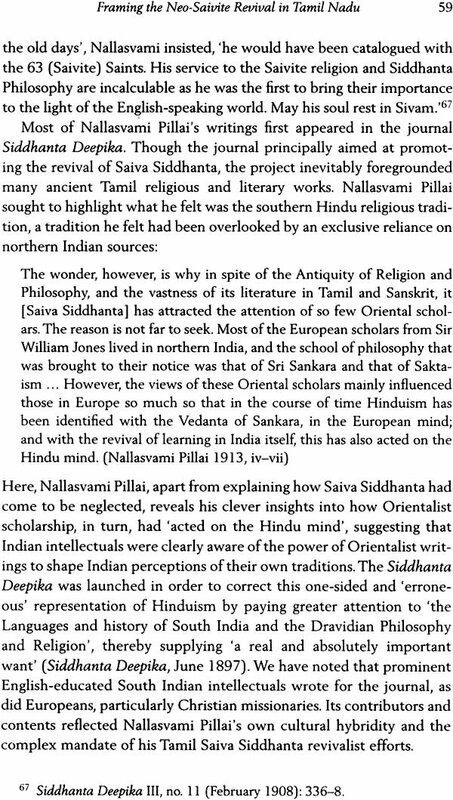 Earlier, he was Adjunct Professor of History at the University of Toronto, from where he had received his PhD in modern South Asian history. Writing this book has indeed been a long and challenging experience. The unusually long time it has taken me to transform this work into a manuscript has been a productive one. 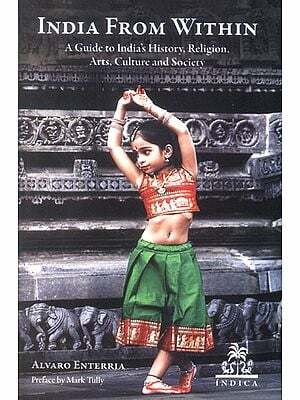 The central thematic that the book grapples with is familiar to many of us engaged with contemporary South Asia with its particularly intense cultural nationalism and politics of identity. To what we do owe the extraordinary intensity that cultural nationalism and the politics of identity have assumed in the subcontinent in the face of admittedly powerful homogenizing, if not centralizing and globalizing, transformations? 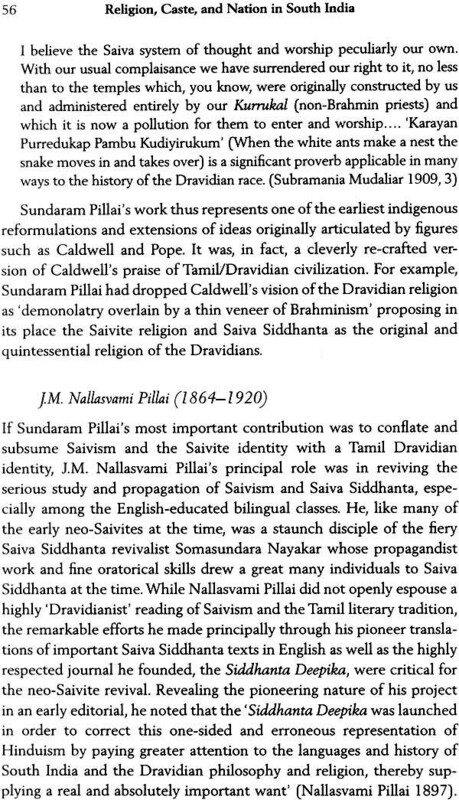 This book essentially explores this question by looking at the specific case of Tamil nationalism and the Dravidian movement in South India. 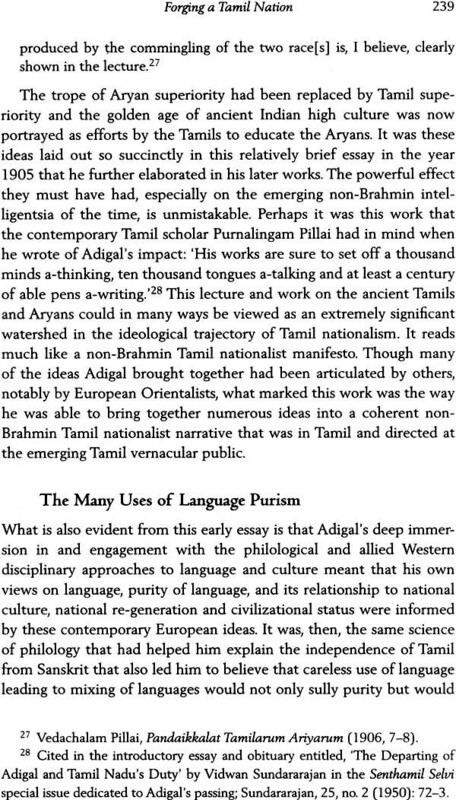 It examines and explores the cultural and discursive claims of Tamil nationalism and the Dravidian movement which had, by the second half of the twentieth century, come to grip the Tamil region and become in a sense the dominant ideology in power in the state of Tamil Nadu. 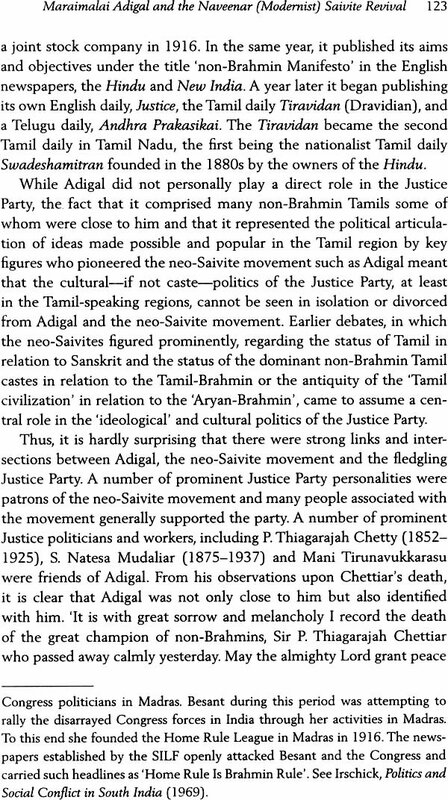 The powerful and almost ‘primordialist’ sentiments that Tamil nationalism and the Dravidian ideology elicited in the Tamil regions of India, and in admittedly different forms in Tamil Sri Lanka across the Palk Strait, certainly raises challenging questions that have continued to elide adequate explanations. 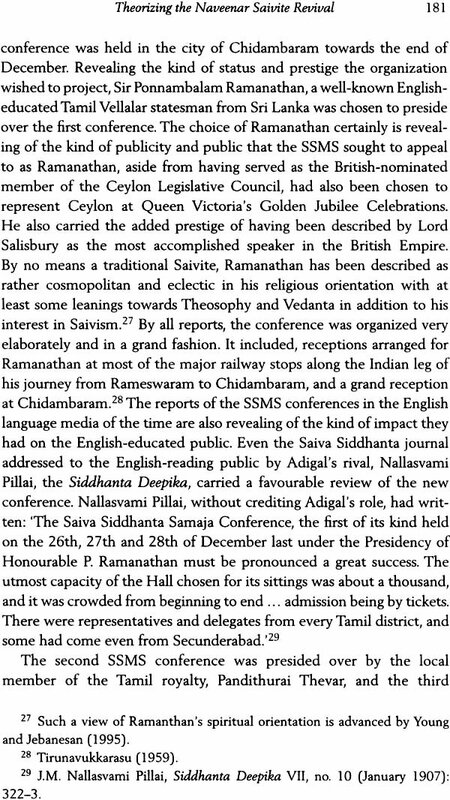 One of the questions which has become almost a cliché among students of nationalism and which continues to resonate for the Tamil case is: To what extent can we attribute the passionate cultural claims and strident cultural politics of Tamil nationalism to an ‘authentic’ and continuous Tamil tradition that had come down from an immemorial Tamil past as many Tamil nationalists themselves claim or, conversely, to what extent can it be regarded as merely a cultural artefact of the colonial period? 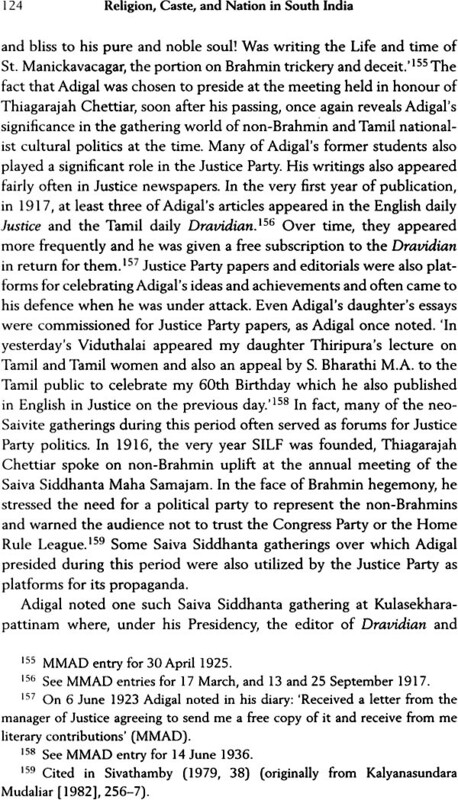 The question had great personal resonance for me growing up in the shadow of the powerful Tamil nationalist and Dravidian cultural politics whose reach extended to the popular cultural spaces of Tamil Sri Lanka where I was born and spent my early years, but was also reinforced by the militant variety of Tamil nationalism thrown up by the long-drawn-out Tamil struggle for political rights in post-independence Sri Lanka in the face of increasingly oppressive state policies and its global dissemination among the Tamil diaspora. It is against such developments that I first became interested in interrogating and exploring the origins and genealogy of Tamil nationalism and the Dravidian movement. When I first began work on the subject in the 1980s, the dominant trend, especially among ‘engaged scholars’, was to foreground the more ‘secular’ and progressive social reformist history of Tamil nationalism and the Dravidian movement and present the phenomena in a ‘secular’ and progressive light. The earlier more ‘conservative’ and religious roots of the movement, while acknowledged, were judged to be elitist and unprogressive, no doubt helped by the influence of left-leaning scholarship that had become ascendant by the late 1960s and 1970s. Entering the debate in the 1980s in the wake of Edward Said’s monumental work Orientalism (1978), with its predominant focus on the colonial and particularly on the alleged overwhelming power of colonial and particularly on the alleged overwhelming power of colonial and particularly on the alleged overwhelming power of colonial discourses to re-shape the self-understanding of the colonized, their subjectivities, and identities, it was hardly surprising that scholars, including myself, were naturally drawn to re-visiting some of the foundational texts of Tamil nationalism and the Dravidian movement, composed during the colonial period, such as the Protestant Scottish missionary Reverend Caldwell’s Comparative Grammar of Dravidian or South Indian Languages (1856), and the writings of predominantly Tamil-Saivite pioneer ideologues of the Dravidian movement such as P. Sundaram Pillai and Maraimalai Adigal. 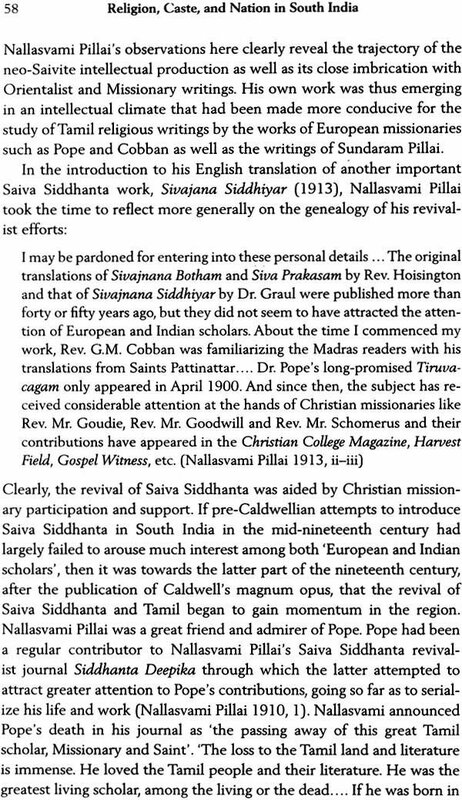 What a close reading of these works revealed was not only colonial and missionary complicity but a substantial ‘religious’ inspiration behind the early formulation and Construction of the Tamil-Dravidian ideology-both Protestant Christian and Saivite/Saiva Siddhanta. What was also striking about the writings of these pioneer Saivite/Saiva Siddhanta ideologues was that it was indeed difficult to disentangle the passionate claims made on behalf of the glory and antiquity of Tamil-Saivite culture from their own steep immersion in the colonial English cultural ethos and sensibility of their time. Even Maraimalai Adigal, an ardent Saivite, and central ideologue of non-Brahmin Tamil nationalism, who had officially adopted the renouncer status of a ‘Saivite-sanyasi’, including the requisite saffron robes, was nevertheless deeply immersed in an English colonial cultural milieu including a deep interest and familiarity with the extant European debates on ‘religion’ from a largely Protestant Christian vantage point. It was this apparent irony or contradiction that inspired me to probe deeper and attempt to resolve what appeared to me to be a major contradiction in the intellectual and cultural origins of Tamil nationalism. 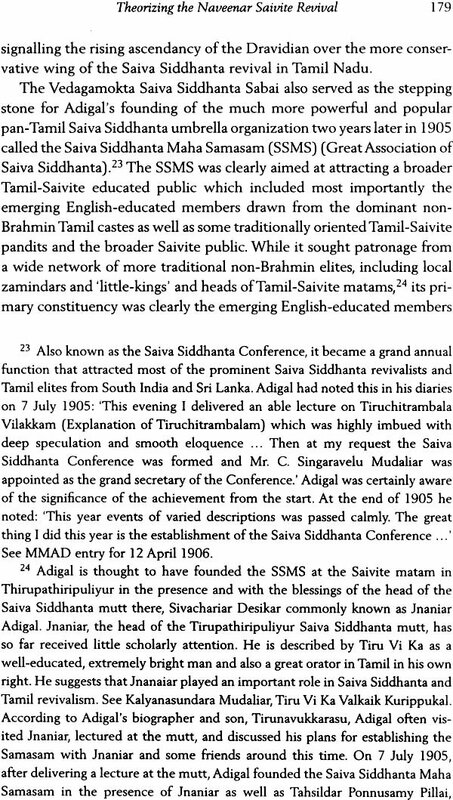 While the earlier more ‘secular’ readings of Tamil nationalism and the Dravidian movement had been content to highlight the conservative and elitist nature of these pioneer ‘revivalist’ efforts, it was not considered essential to ask why these foundational efforts were pioneered principally by Saivites or Saiva Siddhanta ‘revivalists’. 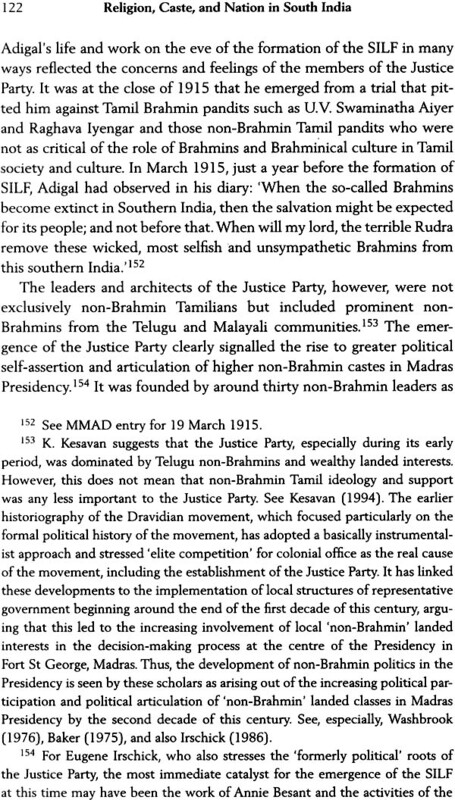 Was the failure to probe deeper into such questions symptomatic of the limits of extant scholarly approaches to nationalism- a failure to note the political significance of ‘religion’ and religious contests (in the Tamil case, especially the contest between neo-Vedantic revivalist currents that undergirded the claims of pan-Indian nationalism and that of the Saivites in the latter part of the nineteenth century)? 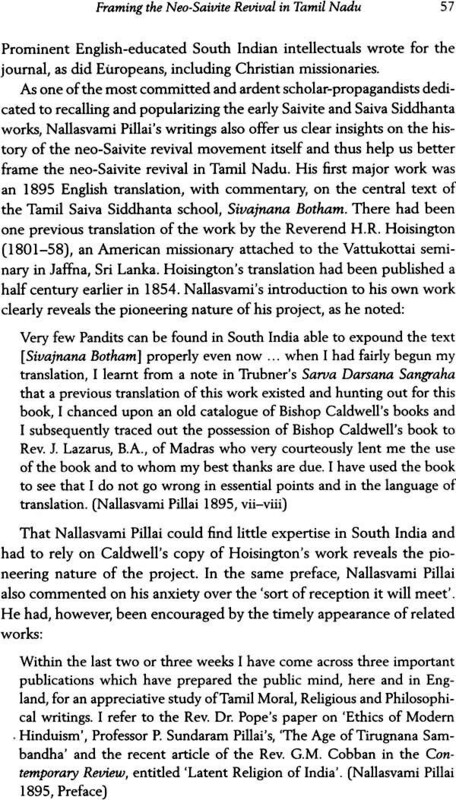 It was such questions that animated the research and writing of this book. 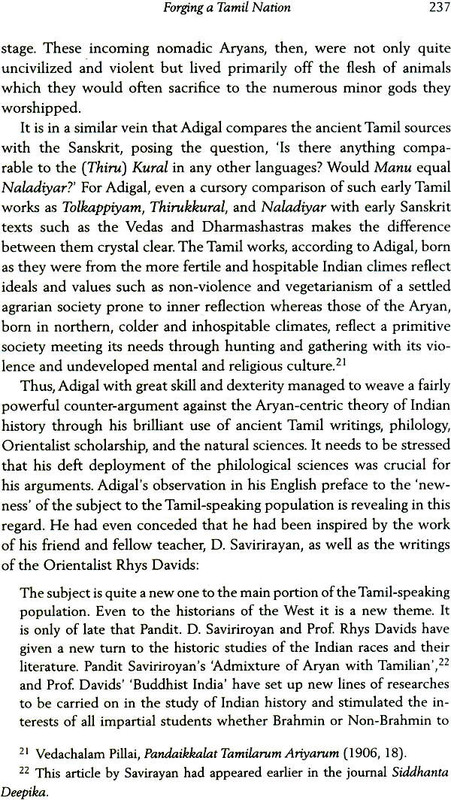 To seek adequate explanations for these had indeed been a long and challenging task that, apart from demanding a close examination of the lives and work of these pioneer revivalists, involved an openness and exploration of a range of interdisciplinary and theatrical approaches to the question of religion, language, and nation, including Marxist, Post-Marxist, Post-Orientalist, Post-Colonial, and Post-Secular approaches. 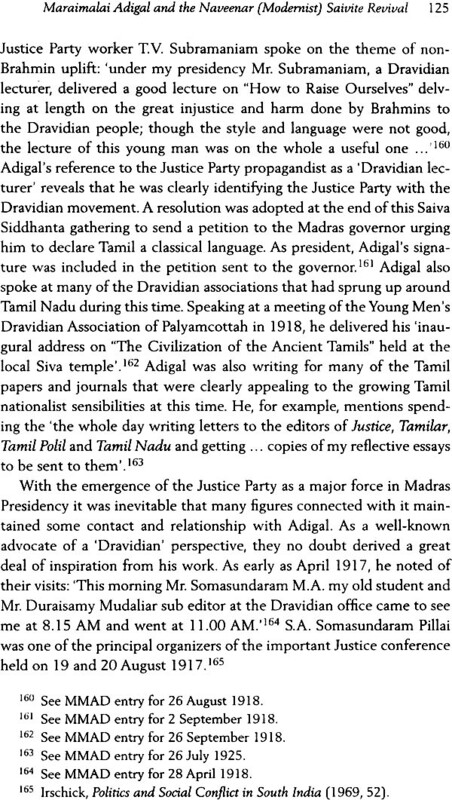 Openness to such explorations has been immensely helpful in the challenging task of making sense and conceptualizing the intellectual and cultural genealogy of Tamil nationalism and the Dravidian movement.